Button fastening. good used condition. The high quality and smart court shoes from Jane Shilton. The almond shape toes make them very comfortable. Monsoon Court Shoe. Condition is Used. Dispatched with Royal Mail 2nd Class. Karen Millen FN055 Neutral Strappy Leather Heeled Dress Sandals Shoes 4 - 6. Condition is New without box. Dispatched with Royal Mail 2nd Class. White canvas with wide navy blue stripes, red patent trim. Red patent heel. BUTA GENUINE LEATHER STRIPED CALF BOOTS. all our products are genuine. SYNTHETIC SOLE. SYNTHETIC & LEATHER LINING. 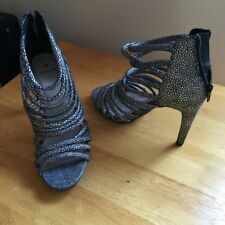 DUNE BEAUTIFUL HEELS WITH MATCHING BAG SIZE 4 EXCELLENT CONDITION . Condition is Used. Collection in person only. Feels more like a UK5.5-6 EU38.5 -39 as I found my foot slipping out even with my silicon insoles and heel buffer. Material - Faux Suede with Texture & Stripe Contrast Toe. (one has a tear in it but still useable). Size UK5.5/EU38.5. Made in Italy. Equates to Missoni US8.5. The shoes have 4 gold rings up the centres which may be in real gold plated. The ankle sling back strap has a slight leather elastic (on the inner part of the strap, so is invisible) which stretches for comfort. We have offices in the United States, Hong Kong and New Zealand. Heel Type Slim. Material Suede. Toe Style: Pointed Toe. Fashion Sneakers. Heel Height: 3.5. Heel Type: Slim. Style: Classic Pump. These shoes typically show a little more wear in their soles and may have blemishes such as scuffs and/ or wrinkles. HERE WE HAVE AN AUTHENTIC PAIR OF STUNNING BALENCIAGA PARIS HEELED SANDALS. BOTTOM STAMP SAYS BALENCIAGA 40 MADE IN ITALY ( BALENCIAGA IS NOW MADE IN CHINA). CONDITION WISE GREAT THEY DO HAVE A COLOURED PALE MARK ON THE BACK OF HEEL ON THE LEFT HAND SHOE. 50% OFF BUY ONE GET ONE 50% OFF Entire Shop! !.